GRANDPARENTS – STILL IN THE PICTURE WHEN MARRIAGE ENDS? One of the most rewarding relationships most people will ever experience is the one between a grandparent and a child. It is very special and no child should be deprived of the benefits that come from spending time with a loving grandparent. Nor should any child be deprived of learning how to take care of that grandparent as the child grows older and their beloved grandparents face old-age. But there are parents who might say otherwise. Even in the best of circumstances, disputes can arise between parents and grandparents. Those disputes are likely to escalate when parents divorce. Or they may develop for the first time if grandparents take sides against one of the parents or against a subsequent step-parent. New disputes frequently arise when one parent remarries after the death of a spouse. A grandparent gives “gifts” and then expects more than a “thank you” in return. While there is a legislative remedy in Indiana if grandparents are being denied visitation with their grandchildren, the outcome in a court of law is rarely what the grandparents expected. Pursuant to Indiana Code 31-17-5-1, a child’s grandparent may seek visitation rights if 1) the child’s parent is deceased, 2) the marriage of the child’s parents has been dissolved in Indiana, or 3) the child was born out of wedlock (and paternity has been established). However, the United States Supreme Court has ruled that the Fourteenth Amendment’s Due Process Clause protects the fundamental right of parents to make decisions concerning the care, custody and control of their children. Specifically, the Court stated that “so long as a parent adequately cares for his or her children (i.e., is fit), there will normally be no reason for the State to inject itself into the private realm of the family to further question the ability of that parent to make the best decisions concerning the rearing of that parent’s children.” Troxel v. Granville, 530 U.S. 57, 120 S.Ct., 2054, 2060, 147 L.Ed2d 49 (2000). In other words, grandparents will not be awarded visitation time if the biological parents are “fit” and have decided it is not in the child’s best interests to spend time with that grandparent. Similarly, “fit” parents may decide how much time with grandparents is in the child’s best interests. Unfortunately, the consequences of alleging that the parents are unfit are so great, and the burden of proof so high, many grandparents wisely choose not to sue their children for grandparent visitation rights. And those who DO frequently burn bridges that can’t be rebuilt. While the marriage is still intact, offer to keep the children so the parents can have a date night every week. Pick them up for dinner and keep them overnight! Don’t “take sides” when a grandchild is mad at his or her parents. Don’t “take sides” when the parents are mad at each other. Don’t buy things for the grandchildren that their parents said they couldn’t have. If the parents are heading for divorce, let them both know that you will always love them. Do not take sides. Find the right words that keep you neutral, such as “I understand how you must feel” or “I’m so sorry you are going through this.” It will be important to not discount their feelings during this difficult time, but you don’t have to adopt those feelings for yourself. It is not disloyal to preserve your relationship with your own child as well as your son or daughter in law! 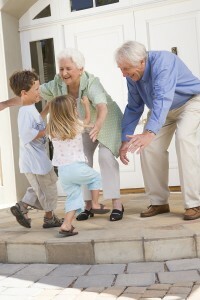 THEY are ALL key to having a relationship with your grandchildren. Don’t feel that you are being “used” when the parents only let you have the kids when it is convenient for them. Both parents will have less time with their children once the parents separate, so understand that your time is likely to be reduced as well – at least for a while. Be prepared to lose some grandparent visitation when your son or daughter in law remarry after the death of your child. That new step-parent may be threatened by your closeness to the children and may believe you are comparing him or her to the parent that died. This is a difficult time for everyone involved and especially for the grandparent who lost a child and who may have stepped in as a substitute parent for a number of months or years. You can prevent this loss by opening your heart to the new step-parent. The key to having an ongoing relationship with your grandchildren is to maintain and nourish your relationship with both of their parents, to value the decisions they make as parents, and to value the importance of subsequent spouses.